I recently took a little road trip to Kalamazoo, Mich. where I visited Letty Klein at Pine Lane Farm. 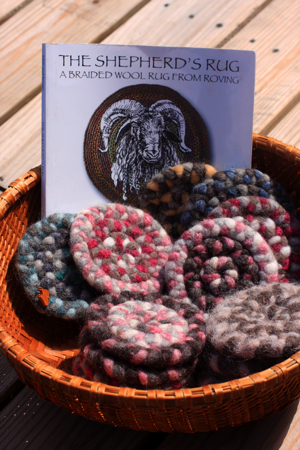 We sat out on her deck and chatted about how her love of animals led her into the sheep and braided wool rug business. You can read her story today in my GR Press art & craft column. 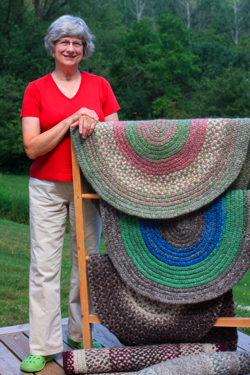 Letty is the co-author of “The Shepherd’s Rug: A Braided Wool Rug From Roving,”a book she wrote with her rug business partner, Ann Brown, of Sterling, Ky. The pair met at a sheep festival and decided to join forces to make custom braided wool rugs. After many years of rug-making the pair decided to share their braided rug skills with the reading public self-published their book. 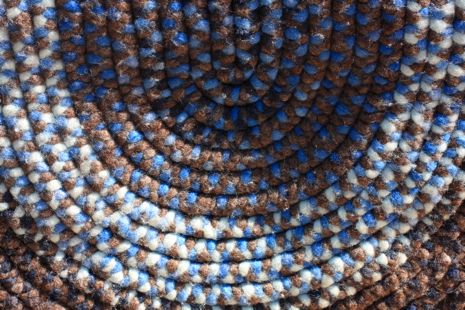 The beauty of these braided wool rugs is that you don’t need any expensive equipment to do it. If you can braid, you can make one. If you’d like to give the technique a try download Letty’s instructions for mug rug coasters and get to work. Woah! I’m really enjoying the template/theme of this site. It’s simple, yet effective. A lot of times it’s difficult to get that “perfect balance” between usability and appearance. I must say you have done a superb job with this. Also, the blog loads super quick for me on Internet explorer. Superb Blog!